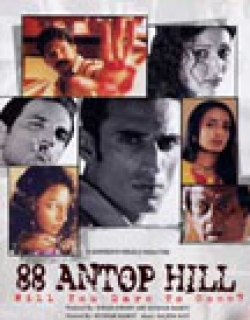 88 Antop Hill is a 2003 Indian Bollywood thriller, suspense film released on Jun 27, 2003. The film is directed by Kushan Nandy, produced by Kiran Shyam Shroff. Pratyush Shelar (Atul Kulkarni) is an over-working Upper middle class man, who is not able to give sufficient time to his wife Antara (Suchitra Pillai) and daughter. Having had enough, Antara decides to leave him. Pratyush is saddened and starts working even more to keep himself distracted. One day, Pratyush gets a call from his colleague Aslam (Harsh Khurana) to come to meet him at a place called 88 Antop hill. Pratyush goes there, and meets a young woman names Teesta (Shweta Menon). They go, have a drink and discuss a little bit about each other. When they return, Teesta invites him to her place and goes to change her clothes. When she doesn’t come back for long, Pratyush is worried and goes in, only to see Teesta's dead body. He runs away. Next morning, Teesta's neighbour summons the police and come to know about Teesta's murder. Unfortunately, the watchman remembers Pratyush's face and the search is on now. Meanwhile, Pratyush meets Aslam next day, who admits playing the prank but has no idea about any place like 88 Antop Hill, nor any woman named Teesta. Pratyush is even more puzzled now. Meanwhile, the police led by IGP Arvind (Rahul Dev) finds the weapon by which Teesta was murdered in Pratyush's house. However, Pratyush is nowhere to be seen. Where is he? What will he do now to prove his innocence? Will he be able to figure the mystery behind Teesta and that place, aka 88 Antop Hill? -- Check out this page for more updates on 88 Antop Hill. This page provides latest and updated information about 88 Antop Hill (2003) movie which released on Jun 27, 2003. 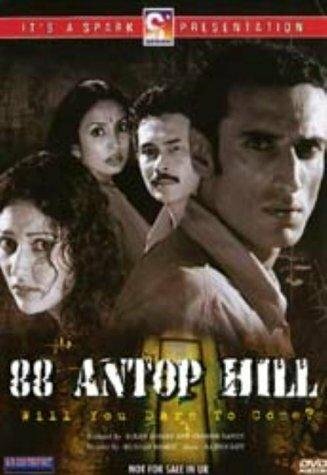 88 Antop Hill (2003) is directed by , produced by , starring .We have also provided 0 trailers and videos, 5 photos, 30 user reviews, and 0 critic reviews.88 Antop Hill (2003) has received 1.8 rating from user reviews.The overall rating of 88 Antop Hill (2003) is 35 and movie is 1.8.You can review, like, dislike this movie and also can add to favorites. You can also find information on showtimes, CDs, DVDs, online rental, online free watching.